Welcome to Real Market Reports! Real Market Reports keeps you ahead of the competition, impresses your clients, saves you time and most importantly, allows you to do what you do best - sell more houses! Our reports are designed to clarify the competitive and often overwhelming real estate market. As a real estate professional, you know how difficult it can be to manage your clients’ expectations as early as possible and validate your claims. Unfortunately, many buyers and sellers today “think” they are smarter than the experts, having browsed the market from their laptops. They want to see the numbers for themselves! We feature statistical analysis of your local markets, including active, pending, expired, and sold listings for the last six (6) months. Also provided are days on market, average prices, pending ratios, list-to-sale ratios, and absorption rates. But how do market reports benefit you as a real estate professional? A windsock tells you the direction and intensity of the wind. Similarly, the absorption rate of real estate is one method to determine how fast homes are selling. Track it over time, and you have a trend. This is a very useful tool that helps real estate agents manage their client’s expectations when listing a home. However, it is important to remember that this is just an estimate and should never be presented as a guarantee of future performance. This figure is very easy to determine on your own. Why Are Real Estate Market Reports Important? As an agent, part of your job includes figuring out where the market has been, where it is now, and where it’s going. Then, once you’ve made sense of things of course, it’s time to explain it all to your clients. But how exactly do you do this in an effective way? 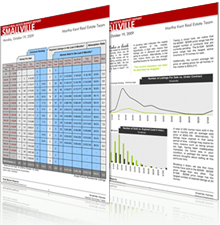 Statistical reports can give you a lot of important information about the market. Actually, whether you’re a professional real estate agent or simply an average home owner who is concerned about their investment, nothing is more valued than a clear sense of things.